Objective: Given a demonstration on how to make an apple pie, students will analyze the make their own pie crust with 90% accuracy and evaluate effects of different fats on pie crust. National Standard: 8.4 Demonstrate planning menu items based on standardized recipes to meet customer needs. How many of you have made a pie before? How many of you have watched a family member make a pie? What kinds of pie do you have for Thanksgiving? 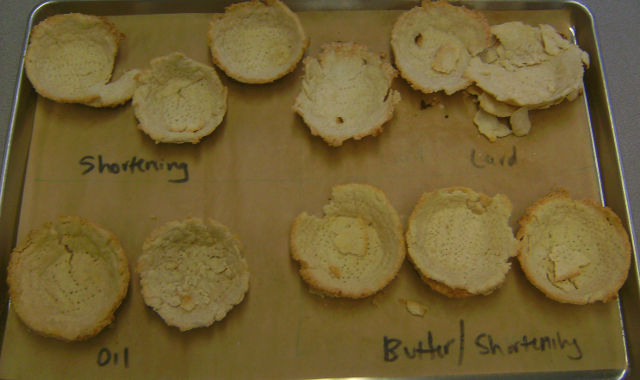 Students will eat their pie shells (filled with pudding) tasting and observing the differences that the fat made on the pie crust’s texture, taste, and color. Offer extra credit to any student who makes a pie from scratch at home. What pie crust turned out the best and why? If you were to make another pie what would you do differently next time? Why is it necessary to cut holes in the top of the pie? Why is it necessary to poke holes in the bottom of a one-crusted pie? What is the secret to making flaky pie crusts?